This set of 10 stamps is ideal for children's role playing. 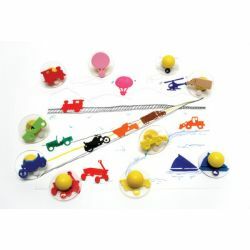 These 3" circular stamps fit perfectly into toddler's hands and help develop fine motor, social, emotional and cognitive skills. Set 2 of transportation includes a train, bulldozer, helicopter, motorcycle, jeep, sailboat, hot air balloon, tractor-trailer, dump truck and a wagon.